Gold & Burgundy Wine Label. 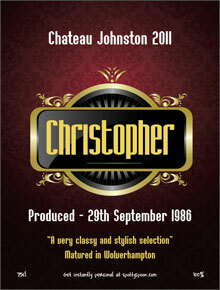 A Classic Wine Label Design personalised for the man or woman who has everything! The choice of true gentlemen. To be drunk with friends at The Rock Club. 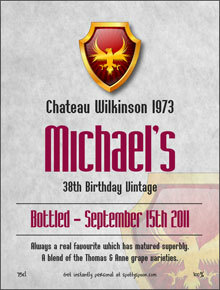 This superb gold and burgundy wine label design can be personalised to celebrate a birthday in real style. It's timeless appeal is sure to make any birthday party special. 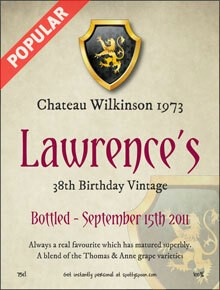 Add the birthday boy or girl's name, the year of their birth and any other details you know to produce an exciting label design which can be placed on birthday party wines. Whatever their age - twenty-one, thirty, forty, fifty, sixty etc. 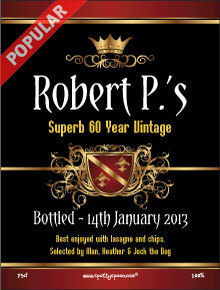 this makes a great birthday gift or why not add it to all the wines at the birthday celebration. Note - good phrases to use include 'A perfectly matured vintage', 'From The Cellars of (their Surname)', 'Blended with (Husband/Wife's name)', 'From The Townland of (Place of Birth)' etc. Great website, easy to navigate, instructions clear and easy to follow and goods received exactly as I wanted them and within the time stayed. Have recommended you already - thank you!